People who have had chickenpox (about 90% of adults) can later develop shingles (herpes zoster). It occurs when the varicella zoster virus—which causes chickenpox and remains then dormant—re-activates. Shingles is known for causing a painful rash on one side. Antiviral medications are an extremely effective treatment for shingles, as long as they are started within 3 days of the rash appearing. 1. 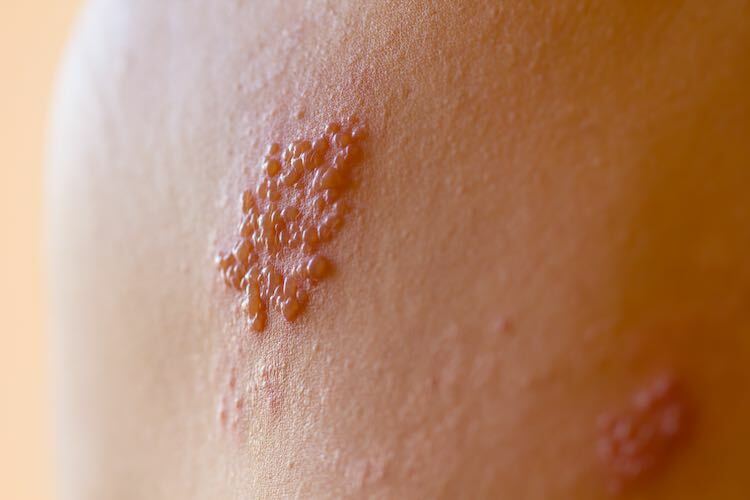 Shingles, also called herpes zoster, causes a painful rash. The rash is made up of many small blisters and it usually appears on one side only, in the area supplied by a single nerve root from the spinal cord. The pain is often sharp and burning or tingling in nature. If shingles is not treated, it can last between 2 to 5 weeks. 2. Sometimes the pain starts before the rash, and sometimes there is no obvious rash. Attacks of shingles aren't always the same. Usually there is pain, itching or tingling in the affected area before the rash appears, and sometimes there might not even be a rash. This can make diagnosis difficult. 3. Shingles is caused by the varicella zoster virus (VZV), but you can’t “catch” shingles. When you first come into contact with the VZV virus, you develop chickenpox. After that, the virus lies dormant in your body, usually for many years. When the virus “wakes up” it can cause shingles. 4. Shingles is most common in older people and those with depressed immune systems. When the immune system is weak, for example, after a transplant, when on treatment for cancer, or in people with AIDS, shingles is more likely to occur. But anyone who has ever had chickenpox can develop shingles. If you are young and healthy and develop shingles, it does not necessarily mean there is a problem with your immune system. 5. Antiviral drugs are very effective for treating shingles. The antiviral drugs valaciclovir and famciclovir reduce the pain and the duration of the rash, but to be effective they must be taken in the first few days. 6. Doctors usually diagnose shingles from the appearance of the rash. Occasionally a skin swab test might be helpful in confirming the diagnosis, but usually a doctor can tell it’s shingles from the one-sided pain and rash. 7. People who have shingles are not highly contagious. If you have shingles, you can’t pass on the VZV virus to people who have had shingles, because it is already dormant in their body. People who have never had chickenpox have a small risk of coming into contact with the virus if they touch the rash of someone who has shingles. Usually the rash is on areas that are covered by clothing, which provides protection. 8. The most common complication of shingles is persistent pain after the rash has healed. This is called post-herpetic neuralgia (PHN). The risk of PHN is highest in older people and those who have very painful shingles. Antiviral treatment for shingles, as well as vaccination against shingles, can help prevent post-herpetic neuralgia. PHN can be a very painful and debilitating condition which can continue for months or years. 9. Shingles in pregnancy should not lead to problems with the baby. The mother is already carrying the VZV virus before developing shingles, and there is no increase in the risk of passing it on to the fetus if shingles develops. 1. Herpes zoster: antiviral therapy (published November 2014; amended Jan 2019). In: eTG complete. Melbourne: Therapeutic Guidelines Limited; 2019 Jan. https://tgldcdp.tg.org.au/ (accessed Mar 2019). 2. Australian Government Department of Health. Australian Immunisation Handbook. Zoster (herpes zoster) (updated 5 Jun 2018). https://immunisationhandbook.health.gov.au/vaccine-preventable-diseases/zoster-herpes-zoster (accessed Mar 2019). 3. BMJ Best Practice. Herpes zoster infection (updated Jul 2018; reviewed Feb 2019). https://bestpractice.bmj.com (accessed Mar 2019).